← Revolutionary Girl Utena: Utena & Anthy Pullips Announced! Earlier this year, Groove started an exciting new collaboration series with Touken Ranbu -Online- . What’s Touken Ranbu -Online-? It’s an incredibly popular online card game in Japan, the player travels into the past and is able to bring various historical swords to life to aid them in their battle to defeat the evil that wants to change the course of history…. all of the swords are of course, personified as attractive boys. I will say the premise is original and it sounds like it would be fun to play and it must be fun to play based on how popular it is! 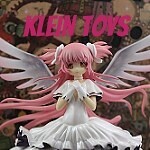 The game is so popular that it has spawned two different anime series based off of it as well as countless merchandise such as nendoroids and other figures. 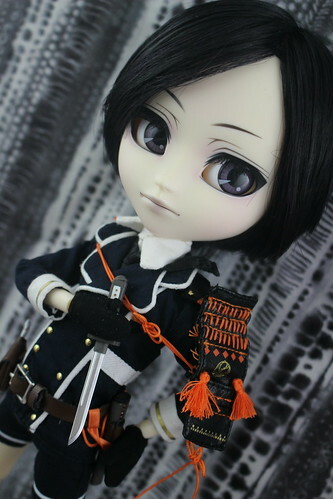 Yagen Toushirou is the first doll to be released as a part of the Touken Ranbu -Online- collaboration series, a second doll Taeyang Higekiri has been announced but his release is still forthcoming. He has a MSRP of 26000 yen which makes him the most expensive Isul released so far. Isul Yagen Toushirou was released back in May in Japan, distribution outside of Japan for this release has been somewhat limited. 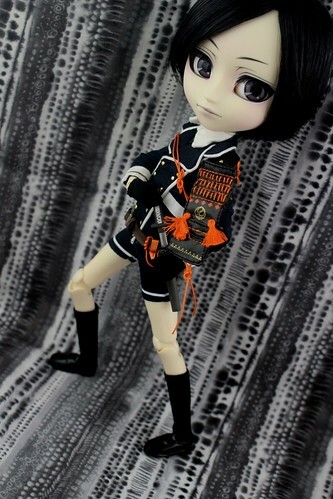 I had been waffling for months about whether or not I should try to import him, I was recently browsing Pullipstyle and I noticed that they had received a small number in stock any remaining willpower I may have had immediately ceased to be; I had to have him! 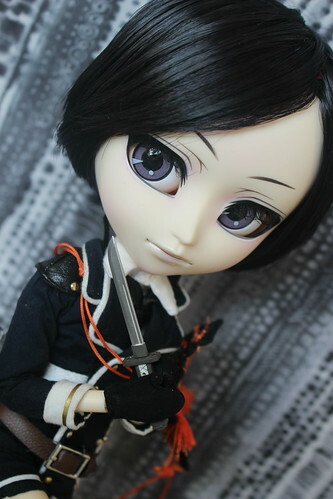 Isul Yagen Toushirou in the box. First impressions seeing him in the box, wow I’m really impressed Groove really seemed to outdo themselves with this release! I was particularly impressed with the level of detail in his military-style outfit. I was surprised to learn that unlike most Pullip family releases he does not come with a collector’s card, it’s not really a big deal to me but I thought it was worth mentioning as I know some people collect the cards. In addition to not having a card, he does not have a “feel like so” poem which I confirmed with Groove via email. How is the quality of the wig? The wig is nice quality, very soft and the color is accurate to the character but if you actually want the wig styled like it is in the promotional photos you have to do it yourself as it does not come pre-styled. I was originally planning on styling the wig myself using dollfie water wax as I’ve had previous experience using it quite successfully to make ahoge (that cute lock of hair that improbably sticks straight up commonly seen on anime characters) on my Dollfie Dreams but I didn’t have any on hand and VolksUSA was out of stock. 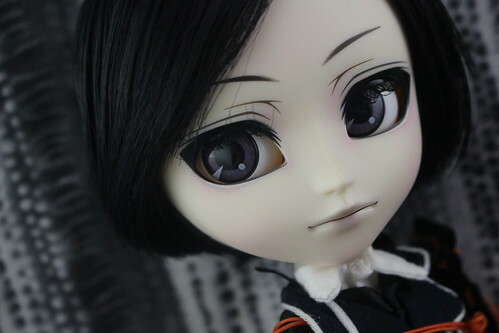 I thought about it afterwards and I realized that I was okay with not being able to style Yagen’s hair because I think it looks good even unstyled plus it’s really paramount to me to showcase the dolls as they are flaws and all, not necessarily what I can do with them so people know what to honestly expect when they order a doll. 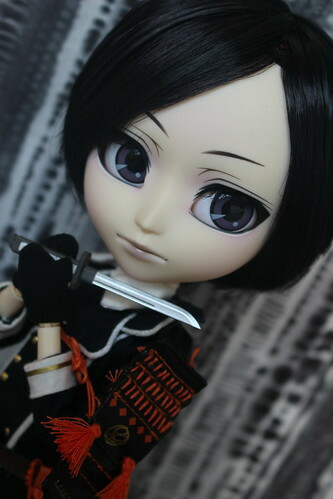 Yagen has a very stylized anime-style face up, it is very faithful to his original character design. 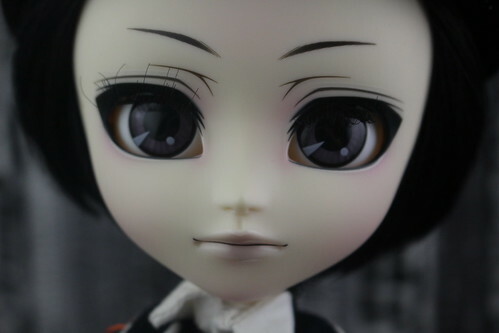 His face up is somewhat noteworthy because it is pretty much devoid of color, the colors used are very stark his eye makeup is black with no shadowing and his lips are shaded in grey and even his eye chip are grey. The colors (or lack thereof) do suit the character nicely but that does not change the fact that he has one of the least colorful face ups that I have seen on a Jun Planning/Groove doll. Let’s take a closer look at the face up, as I said before it is a very stylized interpretation of the character that is not a complaint I feel like the stylized face ups suit anime/comics characters better than more realistic interpretations. Let’s look from the top down…. I absolutely love Yagen’s eyebrows they are absolutely exquisite and they give him an almost tranquil expression. Yagen has a rather pronounced black lid line which is highlighted by a barely visible white lid line underneath it, the white line makes the black lid line pop that much more. His eye makeup is very stylized with almost squared eye corners this helps reshape the Isul eye sculpt a bit to better suit the character. His eye chips are grey with some white highlights they look a bit dull to me but they do suit the character I just wish they were a bit more glossy as right now they seem a bit flat to me. Yagen is devoid of blush. His lips are highlighted by a black lip line while the lips themselves are done in shades of grey with lighter shades being used on the outer becoming darker as it moves towards the center of the lips. 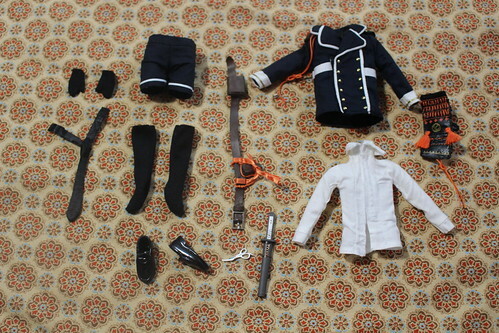 Yagen Toushirou’s stock consists of a sode or an armored shoulder piece, tantou sword with sheath, jacket, shirt, tie, gloves, shorts, belt with pouch, socks, shoes and scissors. 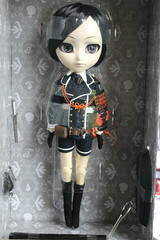 Groove did a fantastic job with meticulously recreating Yagen’s outfit in 1/6 scale, I was impressed overall by how well-made and detailed it is. I absolutely adore his impeccable little military style-uniform and was particularly impressed with how detailed the sode (shoulder armor) is. Yagen does have some medical knowledge which kind of explains why he carries scissors and why the Isul comes with them as an accessory. 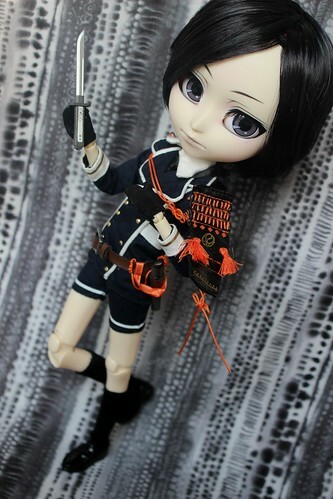 Isul Yagen Toushirou looks as though he is calmly preparing for battle! Having been raised on the battlefield, Yagen Toushirou managed to have a calm air even during battle! 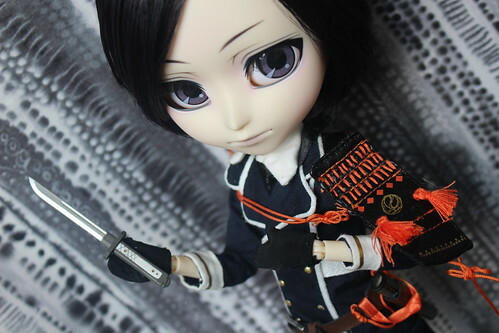 One minor complaint I do have is that I wish that Yagen would have come with a grippy hand to make it a bit easier to hold his sword, I love it when Groove included awesome accessories but they would be even better if the dolls could actually hold them. After thinking about it a bit, I realized that I don’t think I’ve ever seen an Isul with a grippy hand so maybe that was too much wishful thinking on my end (I’ve owned or handled most Isuls with the exception of Jimmy X, Duke, Johan, Kazuya Kujo & Glen so if anyone has them and they have a grippy hand or I forgot please correct me!). 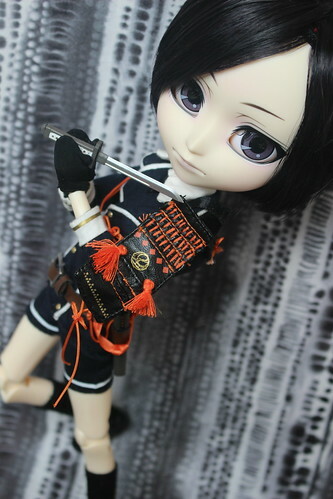 For anyone wondering how I got Yagen to hold his sword in my photos, I used a dab of craft glue on his glove to help it stay in place. I’m really happy to see Groove doing a collaboration series that really showcases Isul and Taeyang, there have not been many Isul/Taeyang releases recently so it is nice to see them so beautifully utilized . I have a weak spot for Isuls so I may be a bit biased but I think Groove made the right decision to make him as an Isul versus a Taeyang. Yagen is one of the shorter characters in the series so in that regard Isul definitely fits him as a character especially once we start seeing other characters like Higekiri get released as Taeyangs but I also feel like Isul’s face sculpt better suits Yagen as well. I had a lot of photographing Yagen Toushirou, dynamic poses really seemed to suit him. For a series about legendary swords that are depicted as attractive boys, Yagen definitely lives up to the attractive part as he is a very handsome boy! Overall I’m very happy with Yagen Toushirou, I have limited experience with Touken Ranbu but even if I ignored his origin and just looked at him as another Isul release he is an amazing release! 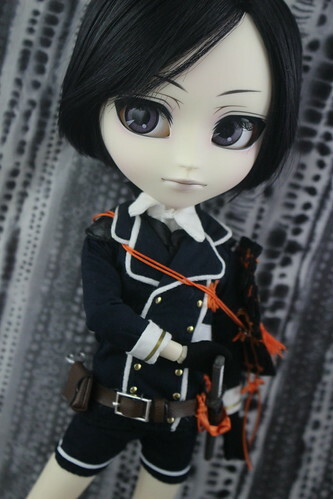 If you find yourself tempted to add Isul Yagen to your own collection he is available for purchase via Pullipstyle. 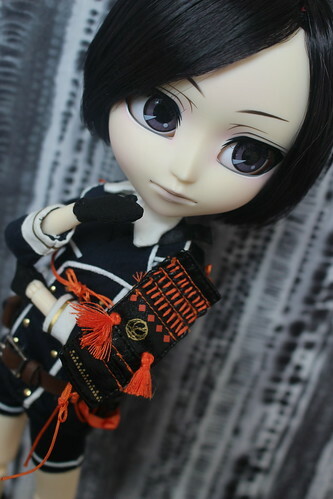 This entry was posted in Doll, isul and tagged 2017 groove, 2017 isul, asian fashion doll, fashion doll, groove, isul, touken ranbu, touken ranbu online, Yagen Toushirou. Bookmark the permalink. I’m so happy you got him as well!! He was my first Pullip so I didn’t know about the collectors cards at all, though that does seem strange to me now that I see others. 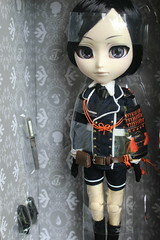 However, did you notice the little slip of paper with 3 lines of Japanese included with the doll? It talks about his gloves and how, due to character’s story/setting, it’s harmful to remove them! (rumors among fans that Yagen’s hands having burn scars). 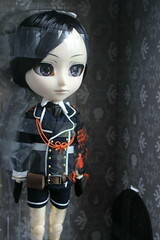 His details are amazing and I”m happy you have him as part of your doll family too! Wonderful post!